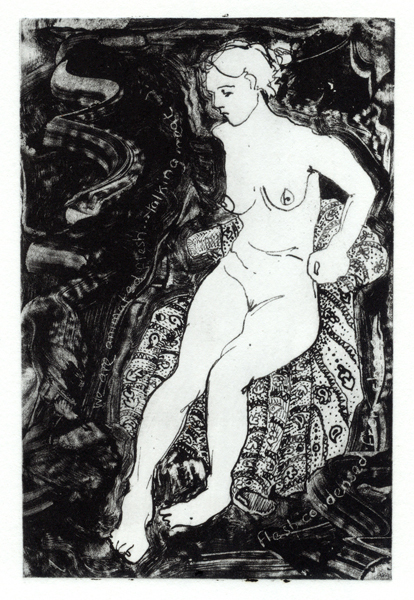 Here’s one of the etchings I have in the Female Expressions exhibition in Neath this month. It’s a small etching called “The Blanket” and it is part of a group of etchings I call the Rinascere series; Rinascere means to be reborn or to revive and is the root of the word Renaissance. Working with professional life models, I did a group of tiny drawings on handmade paper using nib pens, ink and wash in a style inspired by Renaissance drawing. Then I taped a piece of Mark-Resist drawing acetate over it and traced it, but I also adapted the original using much more modern drawing materials – acrylic paint, permanent markers and fineliner pens. Then I transferred it to a photopolymer steel plate and inked it up and printed an edition with the gorgeous old printing presses at Swansea Print Workshop. Sounds easy? !